Concerns about the safe functioning of elevators in old apartments have been highlighted after an elderly woman narrowly escaped serious injury. The resident of Tianshen Mansion on Beihong Road of Changning District was nearly crushed between the rising floor and outside ledge of the elevator last Saturday when it suddenly began rising as she stepped in. Granny Chen, 63, fell over but was able to scramble out. Chen lives at the ninth floor and was going up to the 13th floor to ask her older sister out for a walk. 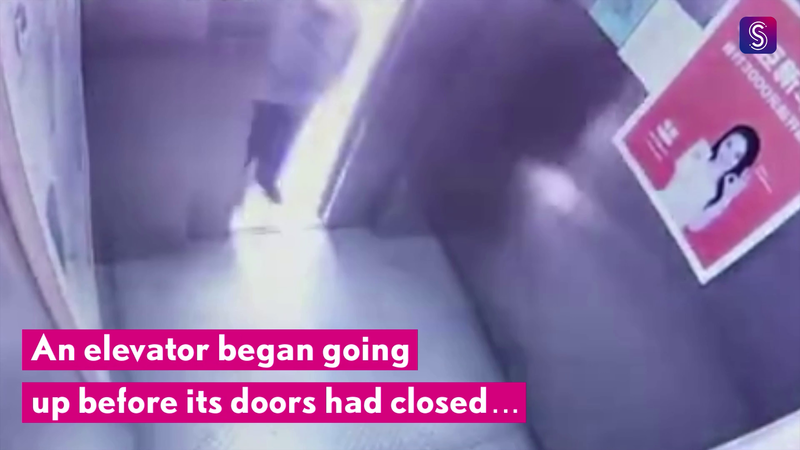 By the time she got out, the floor of the elevator was as high as her waist. “If I reacted two or three seconds late, I wouldn’t be able to stand here and talk to you,” Chen said. She suffered some bruising to her legs. The elevator has been in service since the building was completed in 1999. Wang, manager of the building, said he contacted the elevator maintenance company as soon as he was notified. The market watchdog of Changning brought in a group of engineers and experts on Monday, but they couldn’t find anything wrong either. Now the elevator is sealed and its mainboard has been sent back to the factory. Many residents said they often see the elevators sealed, but no one has really cared until now. Wang said there are 194 families living in the 15-story building, a large number of them are aged over 60. There are two elevators. The remaining operating one is often crowed in the morning with people going to work. “Some of the old people now are not willing to go out for fear of another accident,” Wang said. 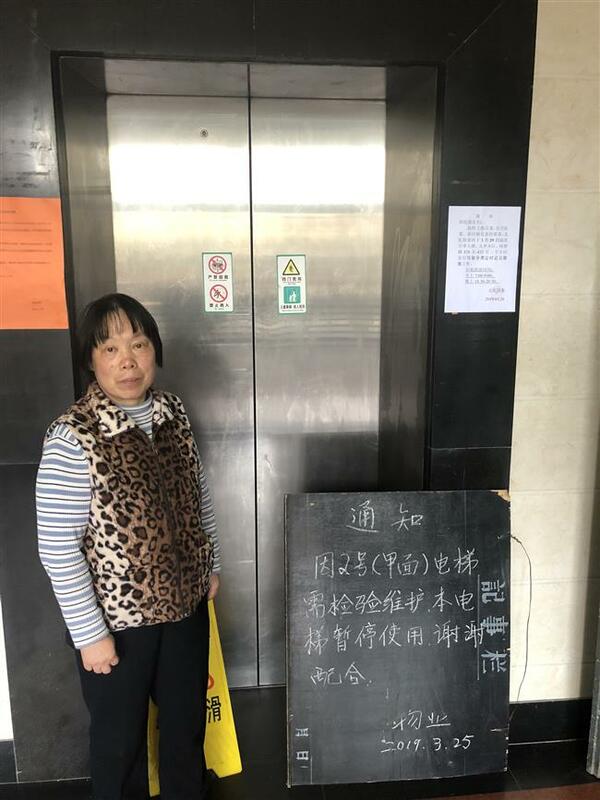 Chen Bing, from the elevator maintenance company Xianshan Elevator Group, is now stationed at the building every day from 8am to 5pm with a colleague. Chen said many old elevators share similar problems. The machine part of the elevators can get rusty over time, and the electrical components sometimes have a glitch. “I come to Tianshen Mansion twice a month to maintain the elevator and apply some oil to the machine,” said Chen. The elevator granny Chen was caught in underwent a maintenance the week before. Zhu Wei, from Changning’s market watchdog, said the maintenance journal was in order. Zhu said if the result shows the elevator is no longer able to run, they will order its suspension. He said to install a new elevator in a building would need the approval of all the residents and local department of housing management. Residents would need to share the expense. Zhu said there is no compulsory regulation for scrapping an elevator after certain length of time. According to Chen, replacing the old elevator with a new one will cost at least 600,000 yuan (US$89,302). Wang, the building manager, said people ask for new elevators from time to time. The condition of elevators is a common dilemma among many old residential complexes. Chen said many elevators he repaired have small components that are rotten or jammed pulleys. At Heyuan Mingcheng, a residential complex in Jing’an District built in 2011, the elevators are also quite unstable. Residents told a local TV station that one of the elevators malfunctioned three times in a week. “It dropped from sixth floor to the basement all of a sudden,” a resident said. Chen said in recent years, the budget for elevator maintenance is getting less and less.